I’m picky about the bath tissue I use. It’s one product I want to be of high quality, but I don’t want to pay a premium price for it. This is what I love about White Clouds new Luxuriously Soft Bath Tissue — thick, absorbent, soft… all that at a reasonable price. White Cloud Luxuriously Soft Bath Tissue is made using this innovative manufacturing technology called “TAD.” TAD, or “Through Air Dried,” is super-premium technology in the bath tissue world. It uses a special machine to blow air through single-ply sheets, creating a two-ply product with amazing thickness, softness, strength and absorption. Bath tissue gone high-tech. Nice. My son even noticed the softness of the new White Cloud. I have to say, he is a very observant 10-year-old. You can only find White Cloud Luxuriously Soft Bath Tissue at Walmart. Find White Cloud products near you. Get Social… and Like White Cloud on Facebook and Follow White Cloud on Twitter. Be sure to get your $1.00 off coupon on White Clouds Facebook page. I love this brand its been the best so far i have ever used. nice product.. i use it..
Aww I was looking forward to trying this – but Wal-Mart is so far away. I wonder if I can order online? Love this brand, it really is soft. Soft is important! I don’t think I’ve seen this brand at my local market – I’ll have to ask. After trying a couple of the top competitor brands, I switched to White Cloud. For me it really is a nicer toilet paper. I hate those little fuzzy things that other “soft” papers tend to leave everywhere. I;ve always really like White Cloud. It’s a soft paper but doesn’t shred easily. please don’t squeeze the…..white cloud? Mr Whipple where are you? I think the brand has improved over the years. I don’t remember it being so wonderfully soft in the past. Just goes to show you don’t have to spend a ridiculous amount on TP to get something soft to wipe with! It seems interesting and lovely! I love how soft it is! I love their tissue boxes I have not tried their toilet paper. Great video! That is the brand we purchase! The price point is great too. I like my toilet tissue soft, absorbent and reasonably price. Looks like White Cloud is the perfect choice! i’m very picky about our toilet paper. I don’t think I’ve ever tried White Cloud before. You know for the quality the price is much more affordable then I expected. I have never tried this brand but would love to give it a shot, especially with that handy coupon. Donna, I had no idea you have an accent! Great video and I’ll have to check out this brand. White Cloud is a great value! I buy this kind sometimes. It’s nice! I am really picky about my toilet paper! Thanks for sharing the $1.00 off coupon. I want to try this out! Ooh sounds super high tech! I have never tried this brand before. I’ll pick it up next shopping trip. I was surprised at how good their toilet paper was, I am always afraid to try other brands and it be not soft but WC was fine. 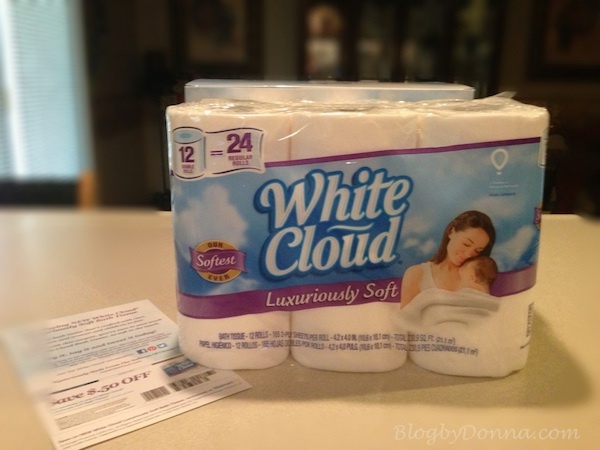 My family and I buy White Cloud Tissue and we love the softness of it. We don’t often buy other brands. I have never heard of this brand before. We use charman ultra strong and we like it. I grew up with Scott’s (or woodchips as we called it in our house lol) and once I moved out I just had to try something new! I think that their ultra soft is too soft and leaves pieces behind. The only problem with 2 ply paper is with 1.5 gallon flushing toilets….they clog them up easily.